What do you get if you mix Ben Folds and Sir Andrew Lloyd Webber? 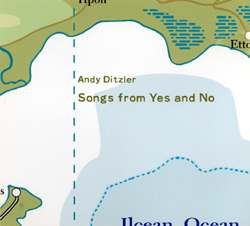 Andy Ditzler by the sounds of it. Songs from Yes and No is a delight. A quirky, strange and bewildering album, to be sure, but one that will make you smile from ear to ear nonetheless. For his debut album, producer, arranger, composer and lyricist (read : smart arse) Andy Ditzler has created something extraordinary. Songs From Yes and No has it all, from musings on Buddhist teachings to elementary French lessons, from free form jazz to samba drum beats and its every single bit as bonkers as that sounds. It’s plainly obvious to me that Andy Ditzler is as mad as a badger but who cares, if he can create something as goofy, experimental and simply bizarre as Just the Six Of Us - which basically takes lines from different songs and puts them together to create something incredible - then I want to spend some time with him. What’s even more amazing about it, is he takes lines from songs I hate -- by people such as Gloria Gaynor, Elton John and Kiki Dee, Carly Simon and Tiffany for fucks sake! -- and melds them together into a song that ranges from samba to indie to mariachi and almost finishes with a real rock flourish before a fog horn type sound comes in and drowns the lot of it. I tell you, it’s a marvel. I mentioned Webber at the beginning and, although I think Ditzler may be a little full of himself, the likeness is mainly (and thankfully only) that each song seems to start with him talking about something nondescript before breaking into song. Songs From Yes and No could almost be a musical -- it makes about as much sense as a Lloyd Webber show! -- but what saves it is the solemn piano playing and acute sense of humour (that’ll be the Ben Folds similarity then) that drives each song. I tell you, you’ll not hear another album as clever, funny and downright bonkers as this all year. At least not one that you’d want to listen to more than once. This is geek charm at its best.